Successfully Added Car Entertainment System + GPS with 7.0 Inch Touchscreen (2-DIN) to your Shopping Cart. Car DVD player and entertainment center with extra large 7 inch touch screen and GPS navigation system (card slot plus OS). 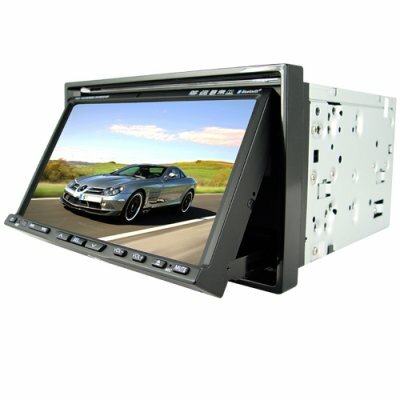 This double DIN sized (100mm) is the in-car multimedia system your auto has been waiting for! This Car DVD Player features the latest in GPS technology and includes the win CE 5.0 environment necessary to run all of today's popular GPS software packages and includes a magnet base antenna with extra long cable so you can locate the antenna anywhere on your car you wish. Of special note regarding this unit is the GPS feature called "Dual Zone". This unique GPS function allows you to listen to music while you are viewing your GPS map. The music will be interrupted by the GPS voice prompts, but otherwise you can enjoy the radio or your CD music while the GPS map is displayed on the screen. This is a special feature that you rarely find in bargain GPS products! Being a true car entertainment system, this Car DVD Player has a lot more than just GPS. It features compatibility with a wide selection of disc and digital media formats as well as touch screen control for easier use while on the road. Other excellent features included a built in TV tuner, SD card reader, and rear view camera input. Combining an excellent design, the latest in entertainment technology, and high performance components, this car multimedia center is a great upgrade for any vehicle (especially if you are on the road a lot). A great wholesale price makes this unit perfect for the resale market, VAR market, or simple personal/company use. As always, it is only available from your source for wholesale direct from China electronic products, Chinavasion. Primary Function: Vehicle touchscreen multimedia player and GPS system with beautiful 7 inch display. Special "Dual Zone" model that allows you to listen to music while in GPS mode. on 2010-01-16 11:43:49 A real great thing! I bought this Car GPS a few months ago. And with iGo8 it's just great! It works well in my Seat Ibiza 6L. on 2009-10-20 05:30:35 excellent is the word !! !